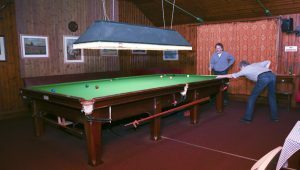 The village obtained a full-size, solid mahogany snooker table in 1932 at a cost of £55.00. There was a deposit of £15.00 and then the remainder was paid off at the rate of £1.00 per month! When David Greenhalgh took over responsibility for running the facility in 2003 the room was fairly ‘basic’, but since then we have had a carpet laid, changed the table lights to LED’s and generally improved the décor to make it more welcoming. Snooker is available to anyone on payment of an annual subscription fee. After that there is a booking system to reserve a day and time and you then pick up the key, play your game, leave the room in the same condition as it was found… and return the key. The lights and heating operate on a slot meter system taking 50p’s and £1.00 coins.The Snooker Club is open to all of our village community, as well as residents from Freathy, our neighbouring parish village, and other local parishes. There is a ‘ladder’ of paid up members who can challenge players above them on the ladder, and a monthly league for those who wish to play competitive games more frequently.